"Some of garlic’s health benefits are pretty well known. One of the most important is its role in cardiovascular health. Allicin helps to keep the blood thin and flowing smoothly, as well as regulate blood pressure and maintain healthy cholesterol levels." Stephen T. Sinatra, M.D., F.A.C.C., F.A.C.N., C.N.S., C.B.T. Garlic, related to the onion family, has been long used medicinally because of its sulfur compounds that are formed after it is chopped, chewed, crushed, or formulated into supplement form. It contains allicin, which is known to potentially help with a variety of health conditions. Research shows the compound allicin is responsible for promoting healthy heart function, cholesterol and blood pressure. It has also been used to treat other conditions like treating the common cold and even to protect against cognitive related conditions. 2. Khalid Rahman, Gordon M. Lowe; Garlic and Cardiovascular Disease: A Critical Review, The Journal of Nutrition, Volume 136, Issue 3, 1 March 2006, Pages 736S–740S. 3. Borek C. Garlic reduces dementia and heart-disease risk. J Nutr. 2006;136(3 Suppl):810S-812S. 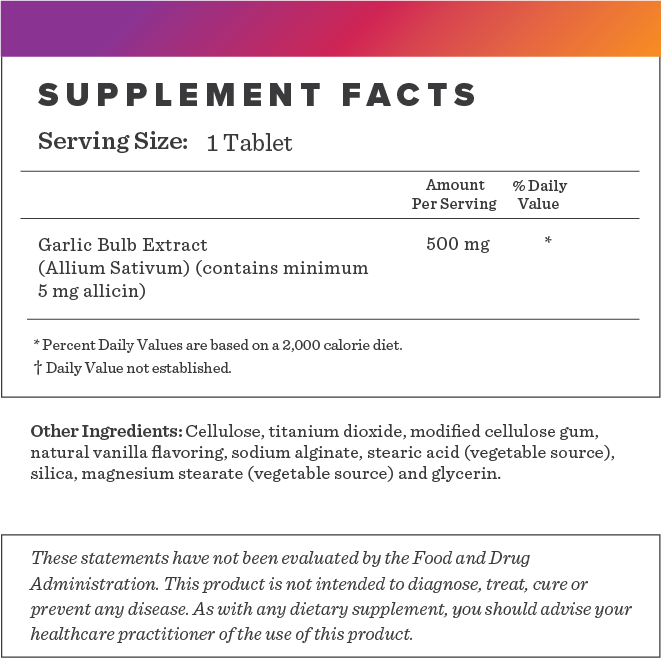 Garlic Bulb Extract (Allium Sativum), Cellulose, titanium dioxide, modified cellulose gum, natural vanilla flavoring, sodium alginate, stearic acid (vegetable source), silica, magnesium stearate (vegetable source) and glycerin. 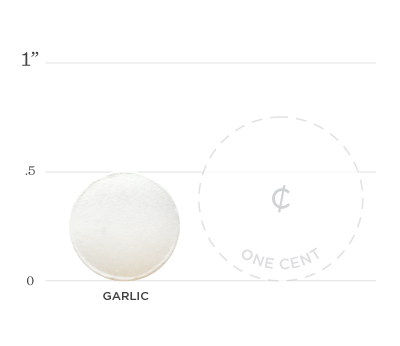 Below we've broken down the main functions of our Garlic and the benefits it can provide. Research shows that garlic has been beneficial in the treatment of uncontrolled hypertension by lowering blood pressure. Studies suggest that garlic can lower blood pressure by dilating blood vessels. Garlic has been shown to protect the cardiovascular system by reducing cholesterol and preventing platelet aggregation. Garlic can inhibit enzymes involved in the creation of lipids and works as an antioxidant. One of the factors dementia and cardiovascular diseases have in common is oxidative damage. Garlic contains antioxidant properties that may help reduce the risk of these conditions (3).